Shirts With Random Triangles: Oklahoma St. Adds Three-Star Athlete Sean Wallace To Its 2017 Recruiting Class. Oklahoma St. Adds Three-Star Athlete Sean Wallace To Its 2017 Recruiting Class. Sean Wallace. Image via 247Sports.com. Oklahoma State has added a fifth commitment to its 2017 recruiting class. Dallas, Tx high school junior athlete Sean Wallace committed to the Cowboys on Monday. 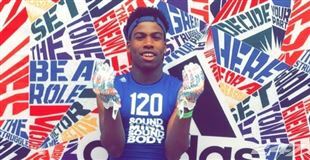 247Sports has graded Wallace as a three-star athlete prospect through its own grading system. Wallace is ranked no. 61 among 2017 ATH prospects, at no. 104 among 2017 prospects from the state of Texas, and at no. 701 in 247Sports national rankings for 2017. Wallace who attends A+ Academy in Dallas, Tx., has served as a cornerback. wide receiver, and kick returner. He stands 5'11, and weighs 185 lbs.